Location: W. Kerr Scott Reservoir, Fish Dam Cr. Gorge to Bandit’s Roost NC Connects sites along southeast shoreline of west Scott Kerr Reservoir. During National Public Lands Day, October 8, 2005, volunteers completed a one mile section of multi-use trail which connects the Yadkin River Greenway and Overmountain Victory National Historic Trail to the Dark Mountain National Recreational Trail System and the recreational facilities at W. Kerr Scott Reservoir. The completion of this section of trail was the result of a collaboration between Brushy Mountain Cyclists, (local chapter of International Bicycling Association IMBA), The U.S. Army Corps of Engineers at W. Kerr Scott Reservoir, the National Park Service and the Yadkin River Greenway Council. 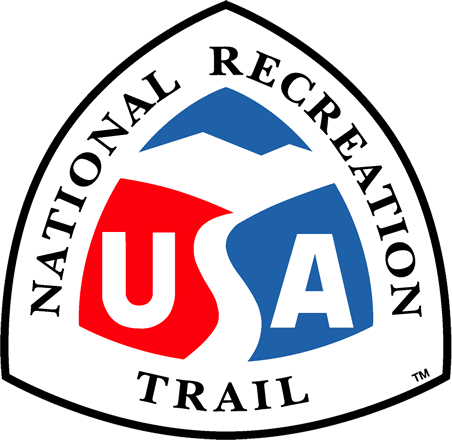 The trail segment is open to the public year round and provides a key connecting link to the area trail system, trail head access and trail parking facilities. The trail is maintained through a Memorandum of Understanding between the Corps of Engineers and the local IMBA chapter, Brushy Mountain Cyclists. The Fish Dam Creek Gorge trail connects the Yadkin River Greenway and the Overmountian Victory National Historic Trail. The trails ultimate connectivity to recreational facilities at W. Kerr Scott Reservoir with facilities along the Yadkin River Greenway such as the YMCA, Wilkes Community College and the towns of Wilkesboro and North Wilkesboro, makes the trail a tremendous recreational resource on Federal Lands managed by the U. S. Army Corps of Engineers. Section 2 - Visitor's Assistance Center to Bandit's Roost Campground. During National Public Lands Day, October 8, 2005, volunteers completed an eight mile section of multi-use trail which connects the Bandit's Roost Campground to the W. Kerr Scott Visitor's Center, Dark Mountain National Recreational Trail, the Yadkin River Greenway and existing designated portions of the Overmountain Victory National Historic Trail system. The completion of this section of trial was the result of a collaboration between Brushy Mountain Cyclists, International Bicycling Association IMBA chapter. The U.S. Army Corps of Engineers at W. Kerr Scott Reservoir, and the National Park Service The trail segment is open to the public year round and provides a key connecting link to the area trail system, trail head access and trail parking facilities. The trail is maintained through a Memorandum of Understanding between the Corps of Engineers and the local IMBA chapter. Brushy Mountain Cyclists. 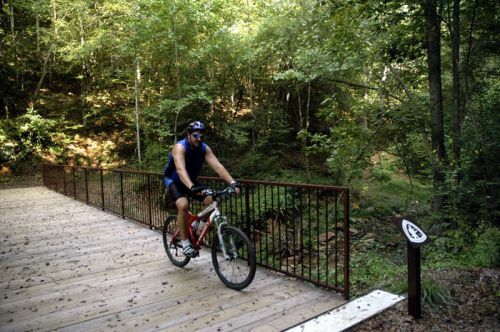 The Fish Dam Creek Gorge trail connects the Yadkin River Greenway and the Overmountian Victory National Historic Trail. The trails ultimate connectivity to recreational facilities at W. Kerr Scott Reservoir with facilities along the Yadkin River Greenway such as the YMCA, Wilkes Community College and the towns of Wilkesboro and North Wilkesboro, makes the trail a tremendous recreational resource on Federal Lands managed by the U. S. Army Corps of Engineers.